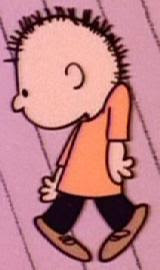 According to Wikipedia, the below Peanuts character — who may be most familiar as the kid who does the pigeon-toed shoulder dance from the Charlie Brown Christmas special — is officially named 555 95472. As 5 once explained to Charlie Brown, his father, morose and hysterical over the preponderance of numbers in people's lives, had changed all of the family's names to numbers. Asked by Lucy van Pelt if it was Mr. 95472's way of protesting, 5 replied that this was actually his father's way of "giving in." 5 also has two sisters named 3 and 4. ("Nice feminine names," in Charlie Brown's estimation to which 5 responds, "We think so."). It can be assumed that their parents are named 1 and 2. It should also be noted that 3 and 4 are both two cute little red-haired girls, meaning that Charlie Brown's universe was populated with two additional fire-haired love interests in addition to the infamous, nameless Little Red-haired Girl. A final notes of Peanuts wonderment: No shitting you, there actually exists a Peanuts special with the title It's Arbor Day, Charlie Brown. EDIT: Ah, it seems the the blog TGLOB did a good job explaining Number Boy's entry into the Peanuts comics.